The following is a message from Father Stephen Imbarrato regarding the National Protest again Planned Parenthood this Saturday, August 22, 9:00 a.m. to 11:00 a.m. The protest is prompted by revelations by the Center for Medical Progress (http://www.centerformedicalprogress.org/). Please join in this important effort to defund Planned Parenthood and end the selling of fetal body parts. I am just sending out a reminder about this coming Saturday August 22nd. Planned Parenthood is located at 701 San Mateo NE. Please park on surrounding side streets and not in PP’s parking lot. This is, I hope, a very convenient time for everyone and I hope that everyone can come for all or part of the 2 hours. PLEASE INVITE ALL OF YOUR FRIENDS AND FAMILY TO JOIN US. I would love to see a long stretch of San Mateo filled with people…families et al. NATIONAL PROTEST is taking place in almost every state in the country, approaching 300 cities. This may be the largest protest of its kind ever undertaken by the pro-life movement in this country. August 22nd also begins an octave of prayer and fast for the end of pre-born child killing and so we will be PROTESTING AND PRAYING! See link below. they will say every kind of false thing about you because of Me! Rejoice and be glad! Your reward will be great in heaven! 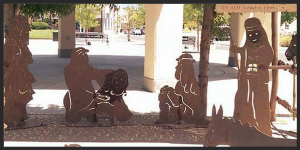 The Freedom from Religion Foundation has called for the removal of Belen’s Nativity Scene. Lawsuits have been threatened by this organization. The Mayor of Belen, Jerah Cordova, is standing fast on the city’s history and is defending the monument. The New Mexico Center for Family Policy is sponsoring a rally in support of Belen’s Nativity scene and Belen’s Mayor Jerah Cordova. The rally is this Sunday, August 23, at 1:15 p.m. at Theresa Tabet Park. The NM Center for Family Policy helps New Mexicans walk in God’s ways, in His truth, in all areas of life by effectively exercising their rights as citizens to build a New Mexico where God is honored, life is cherished, religious liberty flourishes, and families thrive. Learn more atwww.nmcfp.com.